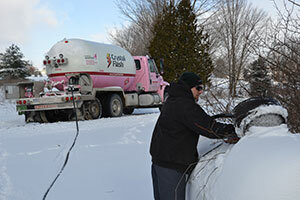 Crystal Flash’s Chad Meinke delivers propane to a home in Sparta, Mich., on a January day that dipped as low as 5 degrees. The air is so cold that nose hairs begin to freeze in a matter of minutes. A smartphone says the temperature is 5 degrees, but considering the wind chill it’s probably closer to 10 or 15 below zero on this January afternoon in Sparta, Mich.
Chad Meinke is accustomed to working in this kind of cold. 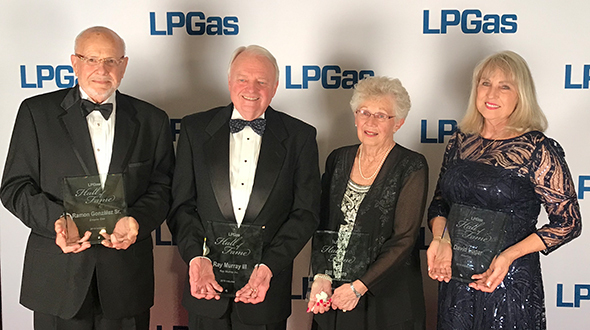 Meinke has eight combined years of experience delivering propane between two companies in the area. He’s now an assistant bulk plant manager at Crystal Flash, where his hours in a bobtail are fewer than at his last job. Meinke is in the bobtail on this day, though, as he is when needed. But this Michigan day is colder than most, and even Meinke is feeling the cold in his bones as he nears the completion of the day’s route. “This job is not for wimps,” Meinke says. A bobtail driver’s job requires tremendous preparation to stay warm and safe. Crystal Flash has done its part to ready Meinke for the elements, he says. The company has provided him with a thick hooded jacket, a winter cap, waterproof high boots that are worn over his own boots and ice cleats that minimize slippage. Crystal Flash’s cylinder fill house at its bulk plant in Grand Rapids, Mich. The company has converted some of its cylinder exchange business to on-site cylinder fill. Meinke and his Crystal Flash colleagues regularly talk about winter safety, too, with weekly meetings on various topics. Hypothermia, frostbite and black ice are among the items discussed. Cold medicines that make people drowsy are talked about, too, so drivers are prepared to remain alert behind the wheel. Still, bitter cold like the kind felt on this January day in the Upper Midwest has a way of affecting even the most prepared bobtail drivers. Last winter was busy for Crystal Flash, as it was for many marketers in the Midwest. But Crystal Flash didn’t experience the chaos many marketers felt, says Dave Scigliano, the company’s president and CEO. Scigliano says the one step Crystal Flash took toward success was to contract nearly 100 percent of the propane it purchased. Doubling its underground storage space in Marysville, Mich., also better positioned Crystal Flash to face more challenging winters like the one in 2013-14. In fact, Scigliano says, Crystal Flash has 2 million gallons of underground storage in Marysville. “Pinky,” as this Crystal Flash bobtail is lovingly nicknamed, is a mainstay on roads around Grand Rapids, Mich. Crystal Flash also uses Twin Feathers Consulting for help with contracting, supply and logistics. Crystal Flash has used that consulting service for 14 years. 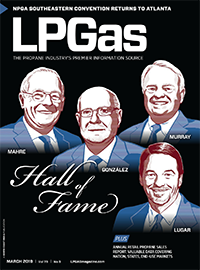 It’s been a propane retailer for more than 25 years, and it’s been in business for nearly 85. 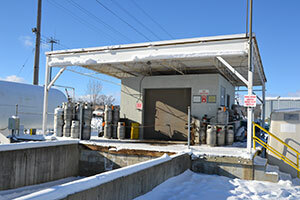 The company started in 1932 with one truck and a rented fuel storage facility in Indianapolis. Its roots in Michigan formed a few years later, and Crystal Flash steadily grew into a company that today consists of three business units. A transport company is one unit. Crystal Flash hauls about 90 percent of its own propane, and it hauls all of its refined fuel products into its 14 bulk plants across Michigan. 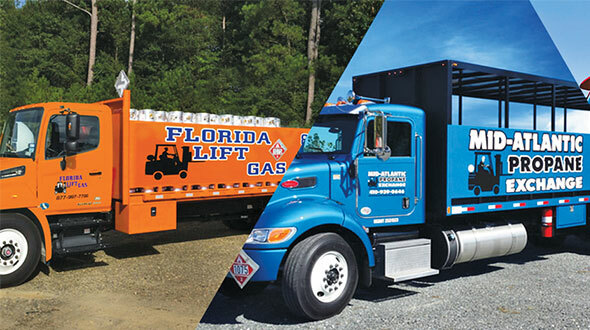 Crystal Flash is also in the refined fuels business, delivering fuel oil and gasoline to residential and commercial customers. Propane is a third component of Crystal Flash, and it’s helped the company diversify over the last few decades. Propane has also helped Crystal Flash grow, and it’s grown in recent years primarily through acquisitions. In fact, Crystal Flash has made eight acquisitions in the last 41 months. Not every company it’s acquired had a propane focus or component, but several did. 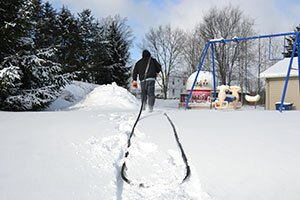 Says Crystal Flash’s Chad Meinke: “This job is not for wimps.” That’s especially true on Michigan’s coldest winter days. To this point, Crystal Flash has only acquired companies within Michigan. 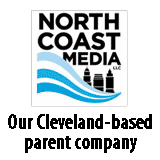 Scigliano says the company plans to pursue acquisition opportunities outside the state this year, though. But not every company is a good fit for its acquisitions strategy, says Dave Montgomery, Crystal Flash’s vice president of operations. 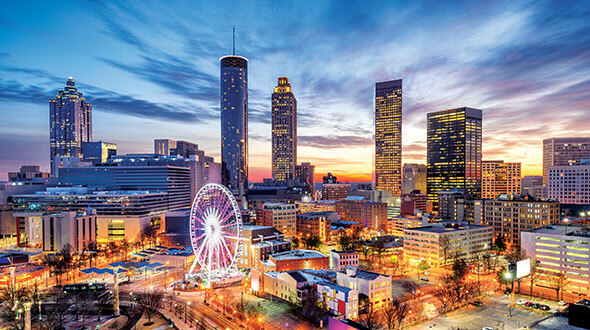 Crystal Flash has found through the acquisitions process that most companies are in compliance with Department of Transportation regulations. Still, Montgomery says, he’s come across several small operations that don’t adhere to hours-of-service regulations. On the road, Crystal Flash is highly visible around the Grand Rapids area when its pink bobtail is out making deliveries. Meinke is driving “Pinky,” as the bobtail is lovingly nicknamed, on this day to nearby Sparta, Mich.
One cent of every gallon delivered from Pinky is donated to Susan G. Komen. 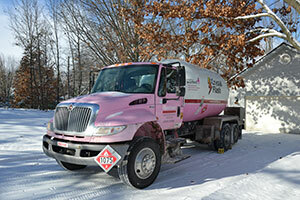 Pinky has made 4,318 drops as of this January day, delivering more than 1.1 million gallons and generating more than $11,000 for Susan G. Komen. Crystal Flash has two pink bobtails in all. A second makes deliveries around Traverse City, Mich.
No one is spending more than a few minutes at a time outside on this frigid day in Sparta, though. With air this cold, every moment in the bobtail is cherished. And with roads this treacherous due to snowfall the night before and off and on during the day, extra caution is taken to get from one place to the next. Experience tells Meinke to be cautious, too. Fortunately for Meinke, every driveway he enters on this day is accessible. Finding drop points isn’t particularly easy, though. Mailboxes that typically provide the home’s address are completely snow covered. And because Meinke is no longer a regular in the bobtail, this route is less familiar to him than it is to his colleagues. 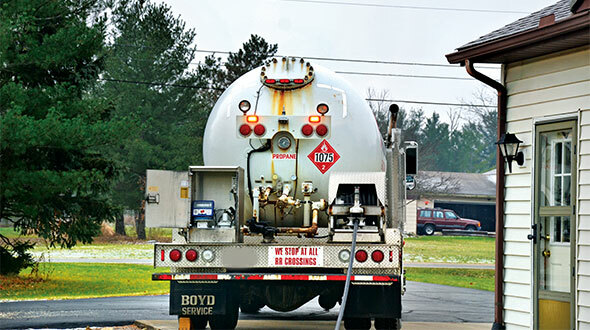 Making time for customers is another important part of a bobtail driver’s job, Meinke says, even though his primary task is to safely deliver propane. Some customers look forward to a bobtail driver’s visits, he says. After making seven deliveries, Meinke receives a call from a colleague asking if he can make an eighth drop because he’s in the area. Meinke doesn’t hesitate to help his colleague and the Crystal Flash customer in need who, in this case, reports her tank level is down to 8 percent full. “Most deliveries are done on 20 percent,” Meinke says. So this one is on the somewhat unusual side. He drops 378.2 gallons at this stop – the largest delivery of the afternoon – and exits the cab of the bobtail one last time to put a ticket on the customer’s door. A woman is waiting for him there. She says a few words, and Meinke returns to the cab. “The woman said I’m so thankful you came,” he says.